Pure water is vital to a person’s health. What many people don’t know is that the water they consume is not pure. Hard water and soft water are terms you may be familiar with; it’s important to understand the difference between the two and how to determine which type of water you have. Knowing what's in or lacking from your water i the first step in determining the best filtration options for your home. Hard water is water with a high mineral content. Common minerals in hard water include calcium, magnesium, sulfates, iron and aluminum. The exact quantities and minerals will vary depending on where you live. Though not harmful to your health, hard water can cause a number of annoying problems. 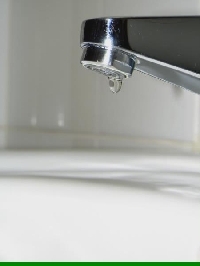 Hard water leaves mineral deposits along the inside of your pipes, known as scaling. Scaling not only clogs pipes, it can damage water heaters and toilet flushing units, and coat the inside of your tea or coffee pots. Unfiltered hard water leaves soap scum, stains and causes your hair and clothes to look drab. The United States Geological Survey estimates that 85% of households have hard water. The exact hardness of your water is measured in Parts Per Million (ppm). You can find out the hardness of your water by checking with your municipality, but it’s a god idea to check your water independently as well. Unlike hard water, soft water contains zero to low amounts of calcium or magnesium ions. Soft water produces lather with soap and toothpaste, making it easier to clean and bathe with. It does not produce soap scum and you only need to use half the amount of soap with soft water. Americans purchase billions of bottles of water every year, but bottled water is only as pure as the tap water that it comes from. The most effective solution to treat hard water and soft water is through a water filter. The best type of water filter for your home will depend on the results of a water test. Water filtration systems include point-of-entry (POE) and point-of-use (POU). POE filtration systems treat all of the water used in the home whether the purpose is drinking, bathing or laundry. POU systems are designed to clean only water from the taps where it is connected, which include faucet filters. For hard water, water filters trap mineral particles while allowing clean water to pass through, reducing the amount of irons, sulfides and microorganisms in hard water. If your pipes are clogged, you may want to ask a plumber for advice on the best type of filtration system for your water and replace any lead pipes in your plumbing. If you have well water, many water filtration softening services will conduct a free test of your water and recommend a softening solution. Though high end filtration systems do not add salt to water, soft water generally needs some hardness correction. Epsom salt is commonly used to replace magnesium ions. You may want to check with your doctor before going this route as many patients on low sodium diets are advised to avoid soft water due to added sodium content.